Collyers Properties, the highly trusted, family owned estate and lettings agency has doubled in size with a new branch, more staff and twice the amount of letting properties having purchased the rentals side of a well-known Bideford agency, making Collyers Properties one of the largest agencies in North Devon. Collyers opened its doors in Barnstaple in 2011. Since then, the Experts in Property agency has sold hundreds of homes and built a lettings portfolio of around 150 properties as well as an outstanding reputation based on its challenge to tradition with a dynamic and unrivalled fresh approach combining strategic marketing, local expertise and the latest technology. Three years ago, it was the first in North Devon to have installed a touch screen in its window giving 24/7 access to its database of properties, and it offers 360° virtual viewing tours along with advertising on social media platforms as well as, unusually, all the major portals including Rightmove, OnTheMarket, Zoopla and PrimeLocation. 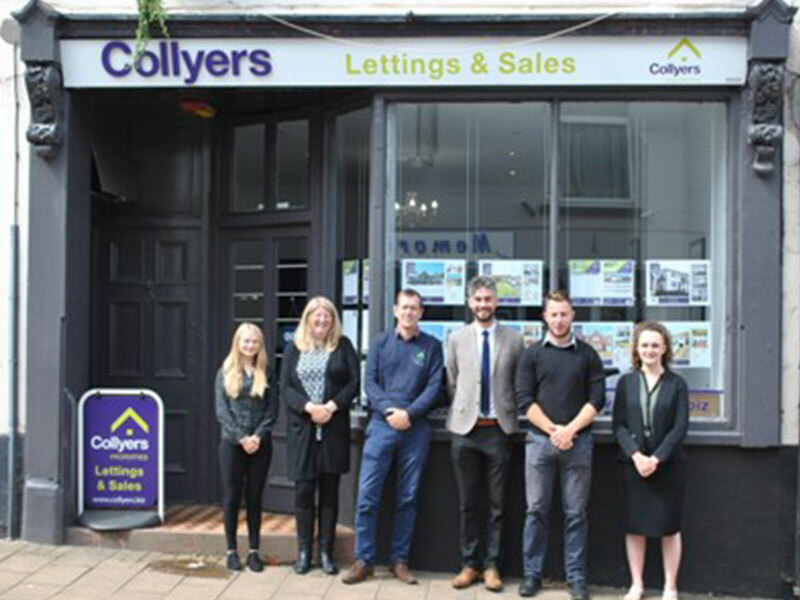 The last couple of months has seen major change for Collyers, having purchased the lettings side of Regency Estate Agents in Bideford, which has doubled Collyers’ lettings and property management portfolio to over 300 properties. Its launch in Bideford has been marked with a new branch on Fore Street in the Northam area of the town. Managing Director, James Collyer heads up the popular agency and spends time in both offices, which handle sales as well as lettings. Kane and Becky work alongside James in the Barnstaple branch. Kane is a long-standing and highly respected expert in the town’s property market, and Becky, who has a background in sales, has joined the team as a trainee property consultant. In Bideford, James’ colleagues are Michelle, Tim and Sam. Michelle deals with the financial side of both sales and lettings – she joined Collyers from Regency to ensure a seamless transition and continuity of care for Collyers’ new landlord and tenant clients. Tim has been a part of the business since its inception, firstly while studying at University and now as a full time and highly valued member of the team. And Sam is embarking on her dream career, now full time as a trainee property consultant. Collyers Properties takes pride in everything it does, recognising and understanding the importance of trust along with smooth and hassle-free property transactions for vendors, buyers, landlords and tenants. Every property sale and rental is as important to the team as it is to its clients and every member of the team strives to ensure every client experience is nothing but perfect – a philosophy that clearly works, just check out the superb reviews on its web site, www.collyers.biz. Collyers Properties is a member of the Experts in Property network of around 80 estate and letting agency offices throughout the South West, working together to reach more buyers with an office on Regent Street in London, and regular exhibitions in the capital, taking Westcountry expertise and details of property for sale directly to prospective purchasers in the city. For further information or to book a free sales or rental valuation without obligation, pop into Collyers at 43 Bear Street in Barnstaple or 7 Fore Street in Northam, Bideford, call 01271 377237, or visit www.collyers.biz.